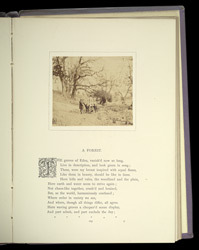 This photograph originally formed one half of a stereograph, where two photographs are created from the same exposure and produced on one print. Here, it is used to illustrate a poem, although the photographer, William Grundy, didn't have that purpose in mind when he first conceived the image. Grundy's stereoscopic collection was purchased by the London Stereoscopic Company after his death in 1859.